If you appreciate the taste of real bacon, you must try our range of Dry Cured Products. A considerable amount of time and effort goes into the method of Dry Curing. We hang the bacon and hams for 10 days ensuring all the moisture is taken out of the bacon, so that when you cook your bacon there is no drip loss. This means that the bacon stays the same size as it did before cooking. The taste is like no other, real bacon at its best. "Tastes like bacon used to taste 20 years ago"
Bacon as it used to taste with no shrinkage and water added. £10.20 per Kg 8 oz. Extra lean Dry Cured back bacon for the healthier option. £9.25 per Kg 8 oz. Ideal for roasting, with a unique flavour. £7.80 per Kg 3 lb. These make a welcome change from ordinary gammon. £7.71 per Kg 8 oz. Perfect for that Fried Breakfast. Perfect for roasting or even barbequeing. £4.90 per Kg 1 lb. A subtle difference in flavour to our Dry Cured Rody Bacon. Smoking the bacon gives it a different taste and texture. £8.20 per Kg 8 oz. Ideal for roasting or boiling. £6.39 per Kg 3 lb. Great with pineapple or a fried egg. All the sausages made at Lords Of Middleton are still made to traditional standards and all are filled and hand linked by fully qualified butchers. Some of our recipes are four generations old. Only Scottish free range pork and prime Scottish beef is used in our sausages. We feel that the finer the quality of meat the better the sausage. Numerous sausages are still to be listed. Let us know what sausages you prefer. 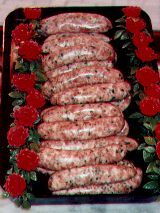 We also make sausages to suit your own personal requirements. For example Slimmers Gold pork sausages which are very low fat. Remember we are here to provide the highest quality service and the best possible meat. We are now stocking new sausage from around the world, including our new Mexican with Chilli and Lime. A reduced salt and extra lean pork sausage with a real bite! £7.70 per Kg 8 oz. Very lean Sausage, nice and tasty. The finest sausage in the shop. Very meaty and low in cholesterol. £10.00 per Kg 8 oz. Now famous all over England. Very tasty, and nice and light. A taste from the valleys.